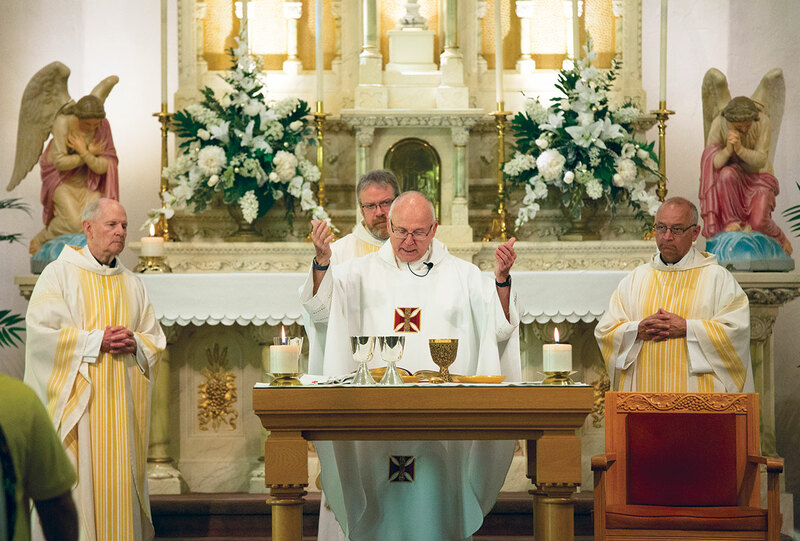 For 38 of his 50 years of priestly life and ministry, Father Wilfred “Sonny” Day has ministered in a host of parishes in the New Albany Deanery and at Providence Jr./Sr. High School in Clarksville. Born and raised in St. Mary Parish in Lanesville in the deanery, it might seem fitting that Father Day has ministered for so many years in the southern region of the archdiocese. According to him, it didn’t come about through a master plan, but just by being asked on various occasions to serve there. “I was simply asked, ‘Would you be willing to do that?’ And I said, ‘Sure,’ ” said Father Day, pastor of St. John the Baptist Parish in Starlight and dean of the New Albany Deanery. Maybe his long history of service in the deanery is the work of the Holy Spirit. Father Day certainly has discerned its influence in his priestly ministry through the years. “I’m convinced that there are no coincidences,” he said. “How many times have I been available, hanging around the house a little longer than I intended, and got a call that I needed to get, such as somebody needing the sacraments? Merle Kruer has had the chance to appreciate Father Day’s ministry during two periods of the priest’s 50 years of service. A lifelong member of St. John the Baptist, Kruer, 75, was there when Father Day served as its administrator from 1971-75 and since 2010, when he was appointed its pastor. Not only does Father Day get along with everybody, it seems to Kruer that he knows everybody in the deanery. Father Daniel Atkins, pastor of Holy Family Parish in New Albany, is a friend of Father Day and has witnessed his friend’s close ties to the deanery on many occasions. Father Atkins knows this from experience. He was a teacher at Providence when Father Day was on the faculty there. Their relationship led Father Atkins to pursue a vocation to the priesthood. In addition to nurturing close ties with the lay faithful of the New Albany Deanery, Father Day has also fostered a strong brotherhood among the priests serving there, arranging weekly meals with them on Saturday evenings and Monday mornings. Father Day has also done much to support Catholic education in the deanery, says Joan Hurley, who served as Providence’s president from 2004‑16. She noted his long service on Providence’s board of trustees and his efforts to promote two capital campaigns at the Clarksville school. When asked what advice he would give to men beginning to discern a possible call to the priesthood, Father Day says it is a vocation that leads to happiness. He has certainly experienced both in his 50 years of priestly life and ministry.